If you are interested in receiving a copy of our plan, please contact us. Often called rainforests of the sea, coral reef ecosystems provide economic, cultural, and ecological services to millions of people as valuable areas of natural beauty, cultural significance, sources of food, jobs and revenues, recreation and tourism, and shoreline protection. The management of much of these valuable coral reefs is the responsibility of the states, territories, and commonwealths where they are found. In the U.S., limited coral reef management capacity of local agencies continues to be a major challenge to increasing the scope and effectiveness of coral reef conservation efforts. Another challenge is the need for adequate and sustained funding to help build and maintain coral reef management capacity at the local level. Also, with limited resources and opportunities to cross-engage, the federal-jurisdiction partnership isn’t as integrated as it could and should be; specifically jurisdictional feedback (e.g., knowledge, expertise, priorities) could be better integrated into federal and national decision-making processes. From a jurisdictional perspective, addressing these three major challenges is the key to effectively managing coral reefs. These key needs are reflected in the AIC Strategic Plan. The Plan is intended to be a guidance document for the AIC, coral reef Points of Contact, and Secretariat over the next five years (2016-2020). This plan is separate from each jurisdiction’s own strategic plan related to coral reef management, and solely related to the AIC. The primary audience for this plan is the AIC and AIC Secretariat; however the plan can be shared with any interested partners. The plan sets out effective and worthwhile goals addressing each of the three key needs mentioned above. These goals are balanced against the realistic limitations of the AIC, which include geographically dispersed members and the additional responsibilities that overlay those of each person’s “day job”. This plan builds on the AIC’s previous plans and helps define the focus and direction of the Committee over the next five years. The AIC will re-visit this Strategic Plan during the Fall AIC Meeting each year to ensure that activities, efforts, and priorities are aligned with and fulfills the objectives and goals of the plan. AIC VISION: Thriving coral reef ecosystems, effectively managed to protect their ecological, social, and economic value for present and future generations. 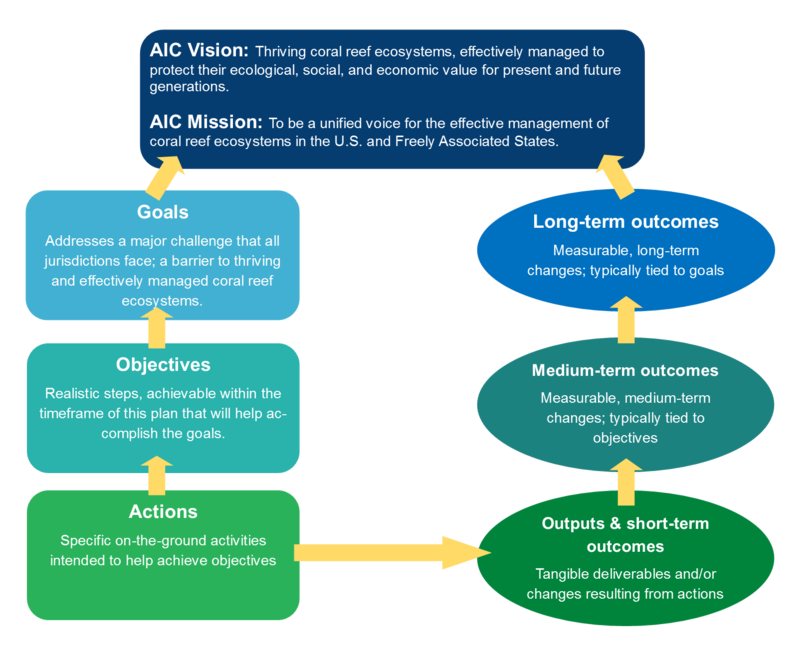 AIC MISSION: To be a unified voice for the effective management of coral reef ecosystems in the U.S. and Freely Associated States. Goal 1) Sufficient capacity to meet coral reef management needs in the AIC jurisdictions and Freely Associated States. Goal 2) Adequate and sustained funding for coral reef ecosystem management priorities in the AIC jurisdictions and Freely Associated States. Goal 3) Jurisdiction, FAS, and AIC feedback and priorities integrated into decisions made by the USCRTF, federal agencies, and other decision makers towards resource-focused outcomes. Goal 4) Sufficient AIC and Secretariat capacity and effective function to meet the AIC’s mission. The AIC Strategic Plan will be implemented through action items under each of the objectives, listed in the AIC’s working Action Plan, supplementary to this overall Strategic Plan. The Action Plan will be updated, as needed, on an annual basis (typically by December 31st of each year) with feedback and input from all POCs and guidance from the AIC Secretariat. Because the Action Plan is a working document it is maintained as a separate document.